Oh happy day! It’s Tuesday already, can you believe it? Did you have a spectacular Easter? Mine was quite lovely…thank you for asking. I ate lots and lots and then ate some more…mostly sweets, which I am now regretting, by the way. I think that I’ll have to start doing some posts about exercising or something of that nature to get myself back on track! No exercise posts today though, instead I thought I’d just put up a put up few photos that I added some texture to and visit with you a bit. It’s Kim Klassen’s Serendipity texture, in case you were wondering. 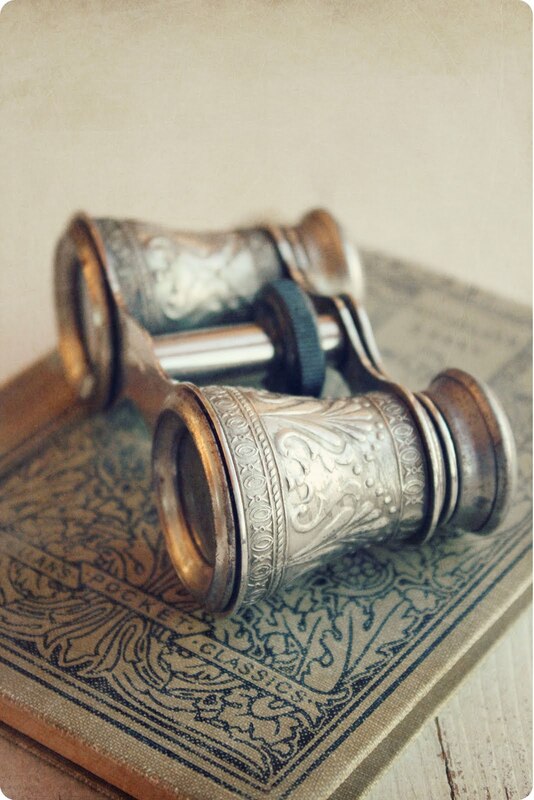 It has a nice, worn, vintage look that I think goes well with the things in my photos…like these little opera glasses. Aren’t they the prettiest thing? I can’t recall where I got them. Oh wait, it may have been at an auction. Yes…that seems right. I think they look so nice paired with that vintage book too. And you know, I can’t really remember when or where I got that either. Are you like that…acquiring things and then never remembering anything about them? I always love it when I buy something old and there’s a little bit of a story behind it. I have an antique table that came with a little note saying that it was from the Pillsbury mansion. It makes me think of the Dough Boy. My heart also goes a little pitter-patter when I find a beautiful old book that’s adorned with handwriting inside it’s covers…someone’s name or a note about it being a gift. It makes it feel like it was loved and a little bit special. Do you have any old, vintage things you’ve found with a story behind them? Well lovely people, that’s all I have to share for today. I think there’s a cookie upstairs calling my name…kidding…no not really 😉 I hope you’re having a wonderful week! I’m sharing this post at Texture Tuesday and the Live Every Moment Photo Challenge. I love the serene atmosphere of your blog. Wonderful photos and your edits made them all the more attractive….enjoy your week! Your photographs are magnificent, and what you do with textures is brilliant. A total inspiration. Very pretty! I love the opera glasses! Beautiful! I just love those photos! I ate too much too! Didn't have any sweets though, which is good! Our easter here in Finland was perfect. I think we even broke broke some record it was so warm and sunny and it is just April, normally it is not so warm here. Now I have to start backing I'm leaving to Tuscany, Italy tomorrow. It is like holiday, when I look in your blog. oh my gosh. gorgeous images. i think holidays were made for eating. that's the fun of it. have a great day. you have something beautiful to share with us in every single post of yours. Your images are beautiful, the textures add the perfect touch. Such beautiful pictures. I love old things, especially ones with stories! I ate too much too. lol. Love the subtleness of the texture. Great job. As always your images are delightful. I do enjoy seeing them. Beautiful photos Tricia. Love those opera glasses. They have lovely detail. Trisha, what beautiful images you've taken. I think I am becoming an addict-of your blog. Just the most beautiful photos. You're an amazing photographer and stylist. So sweet….this should be a cherished piece for you. 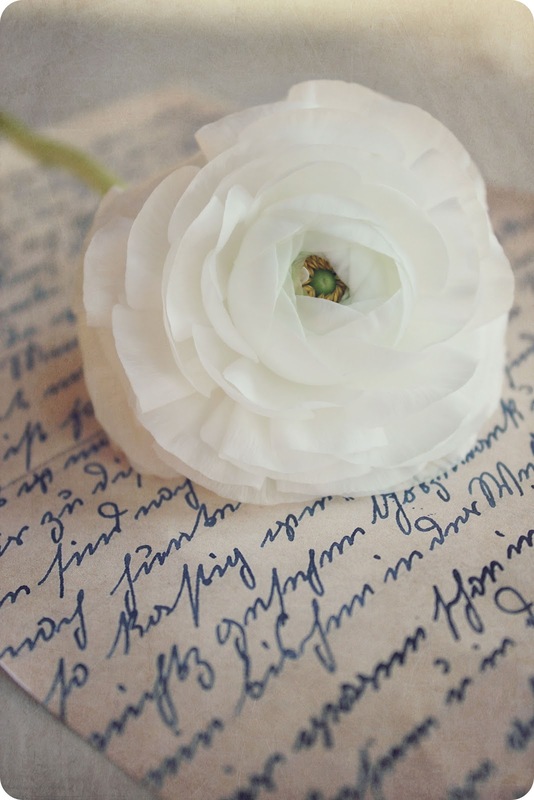 Love the flower and script! Aren't Kim's textures just the bomb? Stunning! The first photo is breathtaking. Lovely vignette – and what a perfect flower. These look really beautiful – I love the second one. Beautiful, beautiful post…what pretty little opera glasses, very elegant. Have a great day! really BEAUTIFUL work!! and such a lovely blog – so glad I found you!! These are just wonderful! Makes me want to go out and search for beautiful vintage finds! As always, Tricia, there is fabulous romance in all your photos! Breathtaking! I actually usually remember where I get my treasures but can't remember appointments or what we did last week. Kinda scary. Just beautiful! Love the look! The blue and canvas colors work well together! Those opera glasses are just stunning!! You've always had such an eye for photography, Tricia, even before you got your new camera – but it's just taken off sky high in the last few months. Go you!! Love those opera glasses. Don't you wonder what their story is? Some fancy lady using them at the opera way back when. Don't you see her sitting there with long gloves and a gorgeous dress? Your picturs look amazing. Glad your Easter was lovely. I love what Kim's textures did for your beautiful photo. Do you have to have Photoshop to use those textures? Happy to hear you had a nice Easter. I'll be following along with your workout blog plan 🙂 I'm feeling candy coated… like you shared in the past. Too funny! I do love the history and loved feeling of old treasures. Especially, vintage postcards and books. You've done a great job with the texture and capturing a mood! Beautiful! Lovely photos, especially the last one with the touch of turquoise in the center of the flower. I feel your joy and your pain about the sweets. I made a carrot cake and no joke, I ate a third of it myself. It was the first time I've made it and it was SINFUL! oh my gosh… i adore these images…beautiful comp and processing… full of loveliness…. This is a lovely post, Tricia…your photos are gorgeous! It's funny, being a vintage dealer, I usually know exactly where I bought everything I have and even how much I paid for it…and yes, I love knowing the story behind an old piece! These photos are so pretty. I love the subtle texture. These are beautiful! I love the texture and your processing is awesome. Hi Tricia! Your photos are gorgeous and have so much character. I LOVE old books too, especially when they have someone's handwriting inside. I find that in the older days, so many more people took the time to learn beautiful handwriting skills. 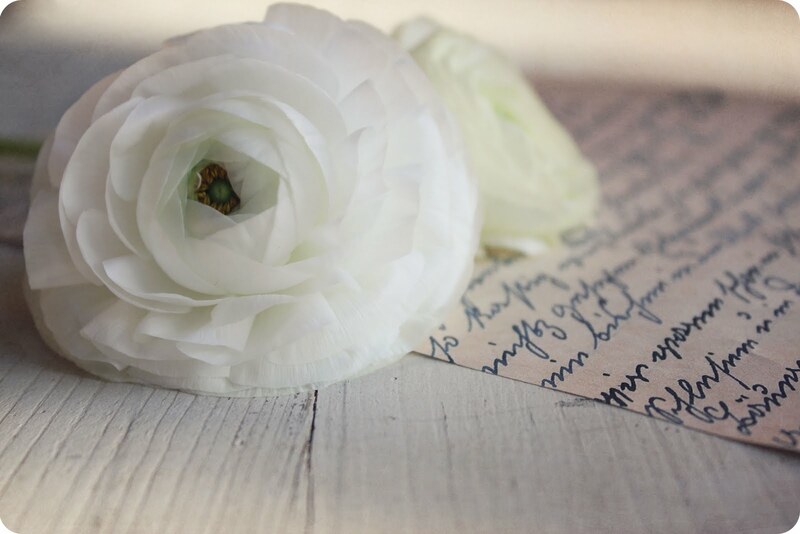 I love that knowing every word they wrote was their special way of communicating and sending a part of themselves to a family member or friend. Something in that history is so romantic. Life has been crazy lately and I'm sorry I haven't had time to stop by and see you. Things are settling down more now. I've missed you. you take the best pictures girl!! Beautiful! I love the use of those textures here! Those roses are so beautiful! So soft!